The Users Insights WordPress plugin comes with out of the box support for the popular e-commerce plugin WooCommerce. 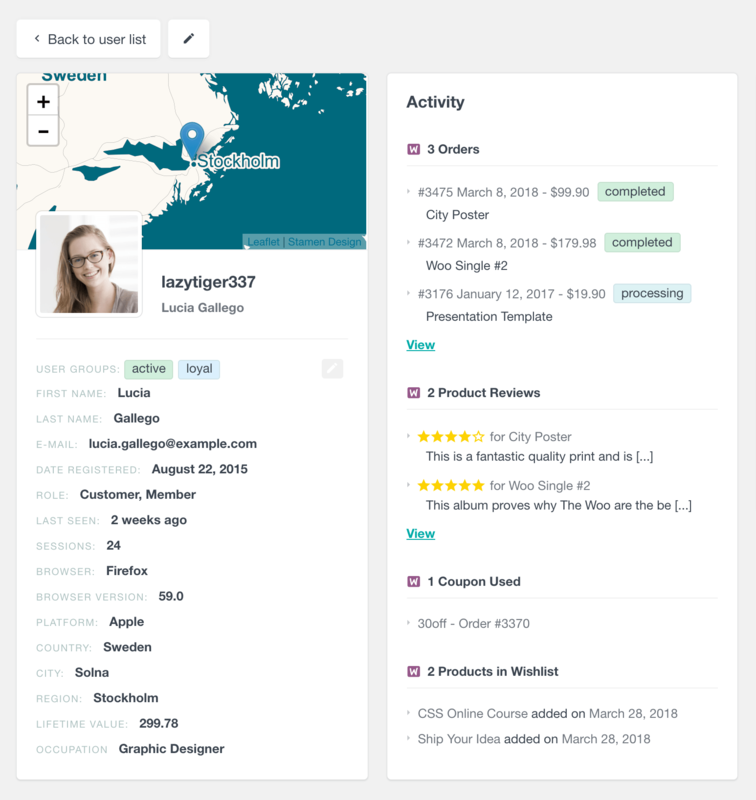 Users Insights can be a powerful tool for your WooCommerce setup, providing structured data about the orders made by each of your customers that are registered users on your WordPress installation. With the dedicated WooCommerce module that comes with the Users Insights plugin, you can easily filter the users by different shop order criteria and then you can export and use the filtered selection to provide more customised services to your customers based on their order history. This feature can be very useful to setup your e-mail marketing based on the number of orders made – once you apply the selected filter you can then export the e-mails of the selected WordPress users and use then use the exported e-mails in your favourite marketing tool to send customised e-mails. For example, you could send gift coupons to your more active users/customers or you can send an e-mail as a reminder to your customers that have only one order. This field shows the date of the first order for each customer. Since it is a date field, you can sort the table by this column in a chronological order. In this way you can see who your first or newest customers are. 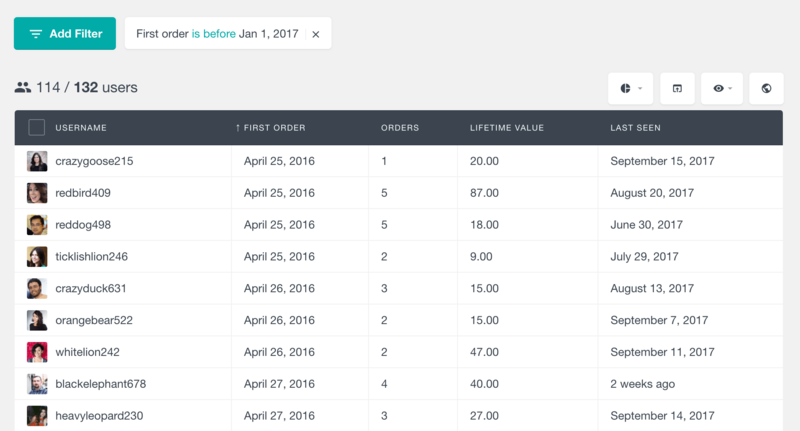 This field is also available in the filters section, so you can easily search your WooCommerce customer list by their first order date. Unlike the Date Registered field that shows you when the user first signed up, this field can tell you when each user has actually become a customer. If your site allows registering non-customer users, this field can be useful to analyze the average time that takes for a user to become a customer. There are various useful scenarios that you can make of this field – for example, you can use the Users Insights filters to select the WordPress users that have made the least recent orders, then you can export their e-mails by using the Export feature and use these e-mails in your favourite marketing tool to send your older customers a friendly e-mail as a reminder of your great products. Order date – lets you choose a range of dates (inclusive of the dates selected). You can optionally leave the start or end date range empty to apply a “on or after” or “on or before” operator. Order total value – you can choose a range of minimum and maximum (inclusive) total order amount. You can optionally leave one of the elements of the range empty in order to apply a “greater than or equal to” or “less than or equal to” operator. 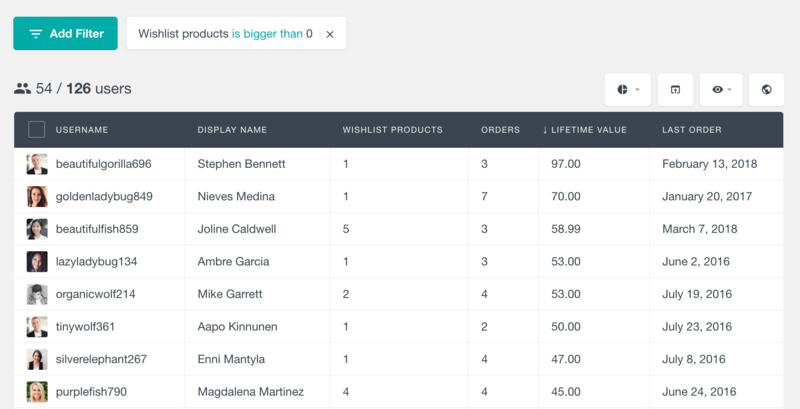 The WooCommerce module of Users Insights also includes a “Ordered Products” filter that you can use to quickly filter you users by the products ordered. The results are matched regardless of the order status. The advantage of using this filter over the “Placed an order” filter, is that this one also provides an “exclude” search. This means that you can filter your WooCommerce customers by the products that they have not ordered. With this feature you can easily export the WooCommerce users data based on the orders made and it can be very useful to send more personalised e-mails to your users. For example, you could load all of the WordPress users that have completed orders or you could load all of the users that don’t have refunded or cancelled orders. At this point you might wonder what the difference is between using the “Placed an order” filter and a combination of the other filters. The main difference is that with the “Placed an order” filter, a user must have an order that meets all of the criteria in order to show up in the results. While when using a combination of the other filters, the user might have one order that matches one of the filters and a different order that matches the other filter. For example, if you apply a filter “Placed an order with Product: Gift card and Status: Completed”, you will get a list of all users who have a Completed order containing the Gift card product. However if you apply a combination of “Ordered products include Gift card” + “Order statuses include Completed”, in the results you may also see users who have a refunded order with the Gift card product and another completed order with a different product. That’s because the two filters work independently from each other and don’t necessarily match the same order. Another field that the WooCommerce module of Users Insights provides is the WooCommerce Lifetime Value field. Every time a user makes a purchase, WooCommerce updates this field in the database to reflect the lifetime value of the user. Users Insights extracts this data and makes it available in the user table and filters. 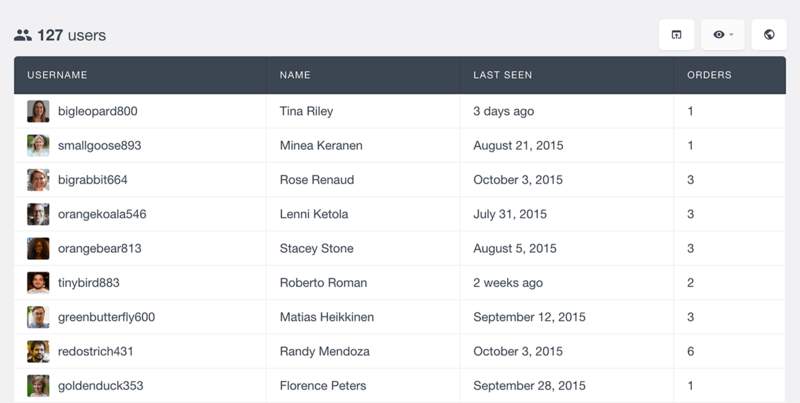 You can now find who your most valuable customers are, just by sorting the user table by this column. Or you can apply a filter to find the users whose lifetime value is bigger or smaller than a specified amount. Another filter that can give you some useful insights is the “Has used coupon” filter. With this filter you can find all the users that have used a particular coupon / discount code. In this way, you can not only know how many times a coupon has been used, but also get the actual list of users that have used it. With Users Insights you can also explore your customers’ billing country, state and city data that they have provided. All three fields are also available in the filters, so you can easily search your customers by their billing address. These three fields are not to be confused with the Users Insights Geolocation module fields – country, city and region. 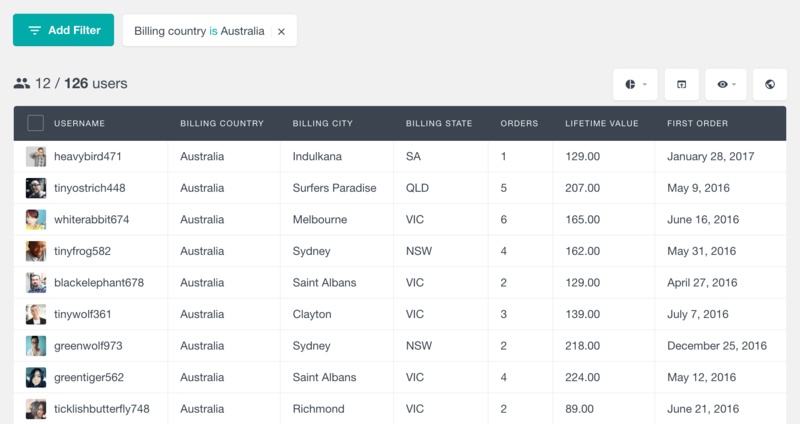 The WooCommerce billing fields are the one that your customers enter on checkout, while the Geolocation fields are automatically detected by Users Insights upon user login. The Reviews column of the WooCommerce module can show you how many product reviews each customer has left. Additionally, you can sort and filter the user table by this column, so you can easily find who are the most active reviewers or which user have never left a review. The WooCommerce module also includes built-in support for the YITH WooCommerce Wishlists and WooCommerce Wishlists plugins. One of the main features of this integration is the ability to filter the customers by the products in their wishlists. As its name suggests, the “Has product in wishlist” filter allows you to find all the users who have a selected product added to their wishlist. Additionally, there is a Number of products in wishlist field and filter available, when using the YITH Wishlists plugin. This field is not available for the WooCommerce Wishlists plugin due to the format used to store the data. By using this filter, you can easily find all the customers who have added products to their wishlists. In addition to the above-mentioned fields and filters, you can also explore each individual user’s wishlist items from the customer profile section. This section lists the names of the products, as well as the date when these products were added to the wishlist. The list also includes a “View” link that opens the default WooCommerce orders page, filtering the orders by the selected user. In this way you can see the full details of each of the orders made by the user. Additionally, as we mentioned above, this section also includes info about the reviews that the customer has left, coupons used and the products that they have in their wishlist. 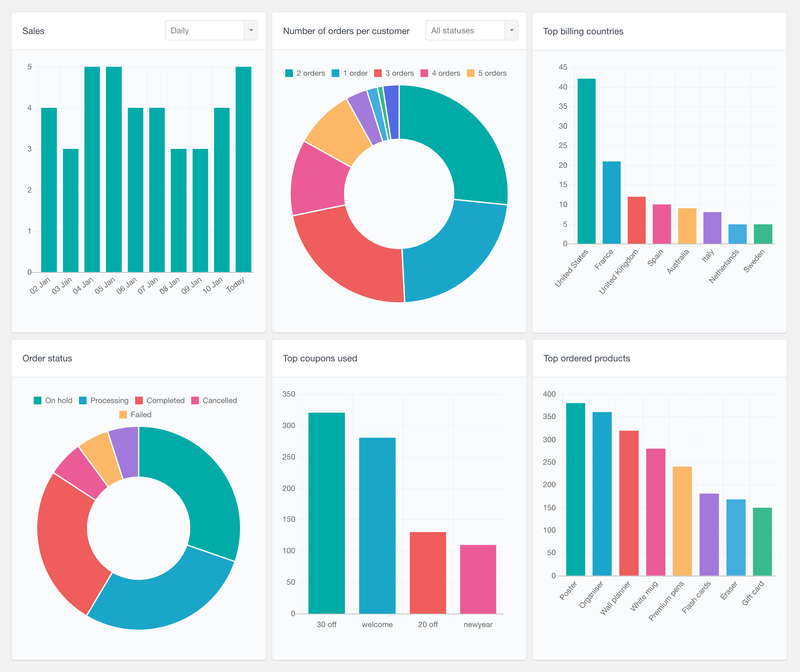 In addition to all the WooCommerce customer fields, filters and profile, you can further analyze your WooCommerce data with the WooCommerce Reports feature. Users Insights provides reports for some of the most important metrics, such as number of sales, repeating customers, order status and demographic reports. 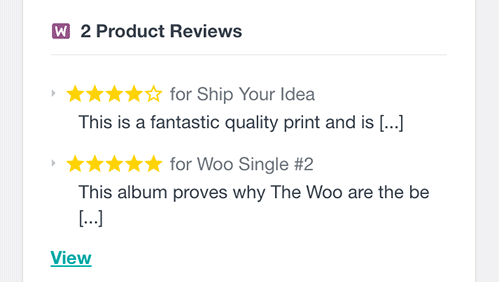 To learn more, you can visit the WooCommerce Reports page. Number of Subscriptions field – indicates how many subscriptions each user has. This field can be useful to find which of the users are actual subscribers. Subscription Status field – displays the statuses of all the subscriptions that each user is subscribed to. It is also available in the filters, which can be helpful to segment the user list by their status (such as active or cancelled). Next Payment Date field – indicating when the subscription is due for renewal. You can use this field to easily find the list of users whose subscription is due for renewal in the next month, just by using this field in the filters. You can learn more about the WooCommerce Subscriptions support on the WooCommerce Subscriptions User Data page. Number of Memberships – indicating how many memberships each user has. Similarly to the Subscriptions module, this field can be useful to find which users have a membership. When your site supports multiple memberships per user, this field can be also used to find the members with most/least memberships. Membership Status – displays the statuses of the memberships of each user. It can be useful to find the users who have an active membership, for example. Member Since Date – indicates the date when the user has first subscribed to a membership. You can sort and segment the user list by this field, which can help you find the most/least recent members. Membership Plan – allows filtering the user list by the membership plan that they are (or not) subscribed to. You can refer to the WooCommerce Subscriptions User Data page for more information on the WooCommerce Subscriptions support.